With the IDS Vision Suite 1.0, IDS provides a complete software support to put you GigE Vision camera in operation quickly and easily. 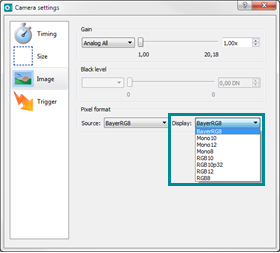 Using the IDS GenTL Producer, you can access your camera via the GenICam interface in your application or any third party software even if the application or third party software have no own support of GigE Vision. The installation of the IDS GenTL Producer is recommended for using the IDS Vision Cockpit.